Robert Weber, professor emeritus and alumnus of Iowa State University‘s Department of Electrical and Computer Engineering (ECpE), passed away in Des Moines, Iowa, on Nov. 21, 2018, at the age of 76. 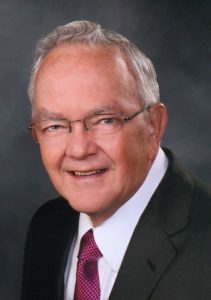 Weber received his bachelor’s degree, master’s degree and Ph.D. from Iowa State in Electrical Engineering between the years of 1963-67. While a student at ISU, Weber was a member of Sigma Xi, a national honor society for research scientists and engineers; and Tau Beta Pi, an engineering honor society. He also was a Fellow of the Institute of Electrical and Electronics Engineers (IEEE). Weber had a 25-year career with Rockwell Collins, now Collins Aerospace, before becoming an ECpE professor in 1988. At Iowa State, he worked with the Microelectronics Research Center (MRC) and the Analog and Mixed-Signal VLSI Design Center and was named the David C. Nicholas Professor, a title he held from 2002-09. Weber received the Warren B. Boast Undergraduate Teaching Award three times, in 1996, 2002 and 2005. He retired from ISU in 2010 but stayed active in the department, continuing his passion for research and mentoring young engineers as professor emeritus until his death. “Professor Weber was a valuable colleague. He and I came ISU concurrently in the late 1980s from industry, he from Rockwell and I from Polaroid. The two of us together worked to make the Microelectronics Research Center into a productive laboratory for new electronic and optical devices,” said Vikram Dalal, Anson Marston Distinguished Professor and Thomas M. Whitney Professor in Electrical and Computer Engineering. Dalal is also the director of the MRC. We received several memories from Robert Weber’s friends and colleagues, which we are happy to share below. If you would like to contribute a memory, please send an email here or add a comment at the bottom of this story. 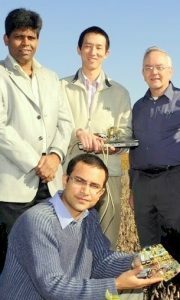 Ratnesh Kumar (far left), Jing Huang (middle standing), Robert Weber (far right) and Herman Sahota (seated); Huang and Sahota were the first Ph.D. students to work on agri-sensors in Kumar’s group. “I have had the fortune of a long and productive association with Dr. Weber. At the time I joined the ISU ECpE Department in 2002, sensor networks were coming up the research horizon. Being in Iowa, it occurred to me that making sensors for agriculture may be cool, although I had little idea at that time. I started thinking and reading about the problem, putting a team together, and sending out the ideas for funding as early as 2003, eventually winning the first award on the topic from NSF in 2006. At this time, I was on the Dept. P&T committee, chaired by Dr. Weber. Our hallway interactions about our ongoing project made it clear that Dr. Weber would be the best addition to take our project to a next level. Dr. Weber became a CoPI in a second incarnation of the project, which started in 2009, and thus began our close association of weekly meetings with joint students. Although he retired a year later in 2010, he and I enjoyed the project and our collaboration. He continued to be on campus on a weekly basis, implementing the project ideas and mentoring the jointly supervised Ph.D. students. This continued for nearly 10 years, and until the week before his sudden departure. Our last research interaction was on Nov. 15, 2018, the Thursday before the Thanksgiving week, the week in which he left us. Over this period, he and I were successful in getting two additional external (NSF) and two additional internal (RIF) funding, completed the co-supervision of two Ph.D. students, and a third in progress on the respective topics: A first-of-a-kind in-soil wireless moisture and salinity sensor (by Gunjan Pandey, now with Skyworks), whose publication (2014) and patent (2018) together have already been cited 157 times; a broadband and broad-amplitude motion energy harvester (by Kanishka Singh, joined NextEra Energy, now with his own startup)— Dr. Weber thought of the idea that perhaps the earth movement from thunder could be used to supplement the power requirements for the in-soil sensors, which was published in 2015 and its patent was approved recently (Oct. 2018); and an impedance spectroscopy based in-soil nutrient measurement approach (by Bhuwan Kashyap) — an external proposal is pending on this idea. Dr. Weber helped with the electronics portion of a fourth Ph.D. project, a first-of-a-kind soil nutrient sensor, published in 2018 with its patent under review. All these works were immediately noticed by several industries in the ag sector, and he and I made numerous trips and presentations to different industries, one of which signed options licensing agreements for two of the patents (soil moisture and soil nutrient sensing, respectively). The agri-sensor work is ongoing and has also branched into biosensing and environmental sensing. Our first sensor work (of in-soil moisture and salinity) was also noted by Texas Instruments, a leading electronics industry, which invited us for collaboration on new projects and has awarded gift funding for supporting the collaboration. Dr. Weber has been a father figure to our sensors related research, and he will remain forever a guiding force for our group as we carry forward his legacy. He is among the finest scholars and persons I have had the fortune to interact with and learn from. May he always keep smiling. 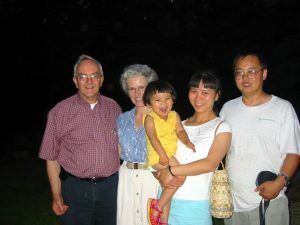 Robert and Joan Weber with Jie Long’s family in Boone, Iowa, on June 19, 2003. Bob had a large impact on my career and my life. As my manager at Rockwell Collins he taught me several lessons and was a great example. I can still clearly recall the day he reviewed my VCO design and said, “this is acceptable, but I believe you can do a much better design.” This motivated me to improve my work, not just on this design, but to always consider how I could do better and if in fact I had done my best. Bob lived a Godly life and from this I could see how a leader and manage could be effective while at the same time be respectful and caring toward others. Bob was the EE PHD who was amazing at translating theory to practice and able to communicate the theory and practice to others. I am always thankful that I had the privilege to work with Bob. Bob was a great human being, a great colleague, a great educator, and always willing to collaborate and help. At multiple occasions, I had opportunity to work with him on different projects, multiple senior design groups, research projects, setting up of High Speed System Engineering Laboratory, and dealing with high frequency signals in optical and wireless (networking) circuit applications. Whenever any of my students needed help where Bob had expertise, it would not be surprising to see Bob working in laboratory with them trying to debug their circuits, teaching them how they must have been designed correctly, and helping them make progress. Bob maintained his cool irrespective of any siltation. I have never seen him get agitated about anything al all. As a colleague, it was always pleasure to work with him. When I heard of his passing away, it was a big shock. Just about a month ago, I was with him in a PhD defense and had chance to chat about life after his (really not) retirement. And he was describing to me his plans for the holiday season. The lesson on unpredictability of life got reinforced once again.